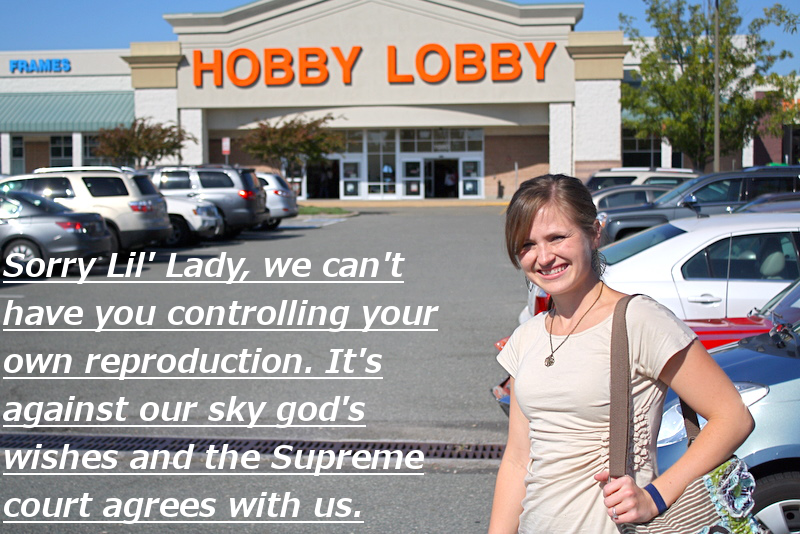 The defenders of Hobby Lobby's decision to withhold contraception coverage to their employees claim that the government can not force Hobby Lobby's owners to pay for contraception which is against their religious beliefs and that Hobby Lobby isn't forbidding employees from purchasing contraception with their cash compensation (just barring it from the compensation in the form of health insurance). Today's decision ignores the fungibility of compensation and the right of the employee to utilize their compensation within their own religious or philosophical beliefs, and that the employers' religious beliefs supersedes that of their employees and extends the employers' beliefs to wherever their employees compensation is spent. Best not to work for or be customer to any business that holds the belief of medical science is the devils work, since they can continue to get tax rebate for providing health care while refusing to pay for insurance premiums. Hobby Lobby's central motivation had nothing to do with contraception as Mother Jones pointed out earlier this year, that their retirement funds included pharmaceutical companies that produce the same contraceptive products that claiming are against their absolute religious beliefs. As if their religious beliefs were optional when dividends were involved but immutable when their employees chose to utilize that aspect of health services. The employer is given the right in Burwell v. Hobby Lobby decision to make the most personal intimate decisions on behalf of their employees as if their personal decisions not to use Viagra or some convoluted religious rationale to be opposed to Lenscrafters could then be extended to their employees, because otherwise they would be harmed. The employer or the spouse of the employer still is not being forced to take contraception themselves, but the choice and liberty of individuals use contraception as part of their health care services are having their freedom infringed upon since they can no longer make the health care decisions with advice from their doctor. The argument that the employer should not be compensate employees with health care services they have an issue with could be easily resolved by the employer not supplying health insurance at all (while forgoing the tax benefits) and letting the employees enter the health care exchange markets for their insurance.But then Hobby Lobby owners won't be able to impose their decisions on their employees, and their religious convictions are opposed to letting individuals chose for themselves how to lead their lives outside of work? To claim that Hobby Lobby has right to impose their beliefs on their employees is contrafactual just it is farcical to claim that the employees have a religious "freedom" to impose on the owners to use specific health care services with the profits obtained from the labor from the employees. The employer isn't harmed from the employee spending their earned compensation (either cash, healthcare, paid time off, etc) as they see fit, even if it is for contraception or paid-time off used to be drunk and hungover it has no effect on the payer of that compensation. SCOTUS in the 5-4 decision and siding with a business that was seeking premium subsidies but on their own terms were to be extended universally the employees of Hobby Lobby would be entitled to impose their religious beliefs that the owner would have to give away his possessions as Jesus Christ commanded, and just as Hobby Lobby continues to collect dividends contraception producing companies, the employees would be allowed to keep their own possessions.